Paul Sample is the creator of Ogri the famous biker character and his cartoon strips of motorcycle adventures. However, his cartoon, illustration and advertising work is far wider than Ogri, as can be seen from his website referenced below. Paul Sample was born in Yorkshire and studied at Bradford College of Art and Central School of Art in London, obtaining an Honours Degree in Graphic Arts. It was whilst in London at the Central College of Art that Ogri evolved around 1967 initially with the name Rorgan. The adventures are partially based on his own experiences as he is a keen motorcycle owner. The cartoon was used by Bike magazine for 35 years up to 2009. Ogri now resides in Back Street Heroes custom bike magazine. Ogri has many cartoon friends such as Rodney Reason, Mitzy and Ogri’s dog Kickstart. Plus over time, other cartoon strips and characters have evolved. Many books of his cartoon strips have been published and a partial list is given below; some have been re-printed in different editions. Sample’s work is both in black and white, (pen and ink) or colour (thin bright watercolour). Whatever the medium, his work is characterised by intense action with activity over the area of art. It is the type of art that can be looked at many times and new features and humour seen. 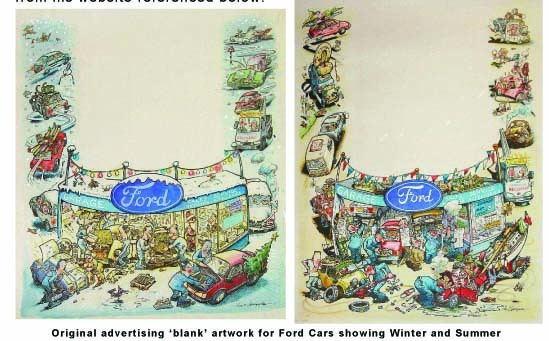 His advertising work clients include British Airways, Smirnoff Vodka, Radio Times, Dunlop, Post Office and Ford. In January 2010 there was an auction sale by Halls of Shrewsbury with nearly 300 lots of Paul Sample art and material from his archive which attracted buyers from round the world. The highest price for an Ogri cartoon strip was £1200.